IntelliHep is exploiting novel technologies and intellectual property to deliver new heparin-based glycans as novel drug leads for specific diseases including Alzheimer’s disease and cancer. This is being achieved through in-house R&D and the development of strategic collaborative alliances with external partners. IntelliHep has developed from work initiated by the Founders at the Universities of Birmingham and Liverpool, and is currently based in the MerseyBio incubator at Liverpool University. IntelliHep is developing collaborative partnerships to exploit our novel technologies and IP to advance the discovery and optimization of heparin-based glycans as novel drug leads in specific disease applications. 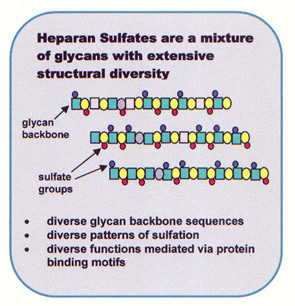 Heparan sulfates (HS): are glycans (complex sugars) found on all cell surfaces which act by binding selectively to a variety of proteins and pathogens and are critically relevant to many disease processes (eg. inflammation, neurodegeneration, angiogenesis, wound healing, cardiovascular disorders, cancer and infectious diseases). Many of these activities have been detected using heparin, which is a subclass of the HS family of glycans, and the world’s largest selling pharmaceutical by weight. The use of heparin and its derivatives in the clinic illustrates the importance of the HS family of glycans and their potential as therapeutics: over 70 years as a safe class of anticoagulants (preventing blood clotting) and in the treatment of cardiovascular disease, with multi-billion dollar markets. It has also been known for many years that heparin has a wide range of other biological activities including effects on tumour growth and spread, microbial infectivity, inflammation and wound healing. This opens the possibility of targetting “next generation” heparins for these new applications. Heparin reduces tumour spread and prevents invasion in animal models, and there is anecdotal evidence for promise in the treatment of human cancer. HS has been linked to neurodegenerative diseases such as Alzheimers’ and Prion disease and has been shown to bind and regulate protein targets for these diseases. Heparin binds and regulates many proteins associated with inflammation (the process underlying diseases such as Asthma and Arthritis) and also many involved in tissue maintenance and repair. Heparin can prevent numerous bacteria (eg. Chlamydia, Staphlococcus aureus, N. gonorrhoea) and viruses (eg. Herpes simplex, HIV) binding and infecting human cells. IntelliHep has developed a proprietary platform technology for the semi-synthetic production of heparin-based glycan libraries exhibiting targeted diversity. 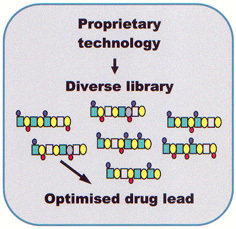 These libraries enable the discovery and optimisation of novel lead compounds for specific disease applications. These libraries can be screened for activity and active glycans identified. Further targeted libraries can also be prepared in response to feedback from initial testing, facilitating optimisation of activities. 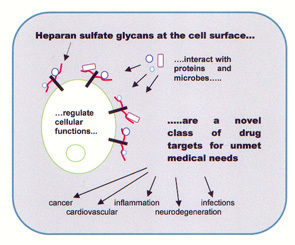 The production of specific glyans can be scaled-up for further biological, structural and mechanistic studies and pharmaceutical testing. Successful proof-of-concept studies have been undertaken and lead candidates identified for application in Alzheimers disease and cancer, with protected IP. Partners will benefit from access to diverse, responsive glycan libraries for drug discovery. Successful proof-of-concept studies have been undertaken and lead candidates identified as potent BACE1 protease inhibitors for reducing amyloid generation. These have potential as a first-in-class safe disease-modifying treatment for Alzheimers’ disease. Exclusive IP has been in-licenced from the University of Liverpool, and is protected by a patent granted in US, Europe, Japan, Australia and Canada. Preclinical and safety studies are currently ongoing. Reference: Patey, SJ, Yates, EA, Edwards, EA & Turnbull, JE. (2006) Optimisation of heparin derivatives as inhibitors of BACE-1, the Alzheimer’s β-secretase, with reduced activity against Factor Xa and other proteases. J Med Chem 49, 6129-6132. Successful proof-of-concept studies have also been undertaken on lead candidates identified as inhibitors of galectin-3 as a target for cancer treatment. Potent inhibition of cancer metastasis has been demonstrated and studies on anti-primary tumour activities are underway. IP is protected by a granted patent and a licence agreement is currently being negotiated from University of Liverpool. Reference: C Duckworth, SE Guimond, Hughes A, French, N; Yates, EA; J Rhodes, M Pritchard, L Yu* & JE Turnbull*. (2015) Chemically modified, non-anticoagulant heparin derivatives are potent galectin-3 binding inhibitors and inhibit circulating galectin-3-mediated metastasis. Oncotarget 6, 23671-87. *equal senior authors.